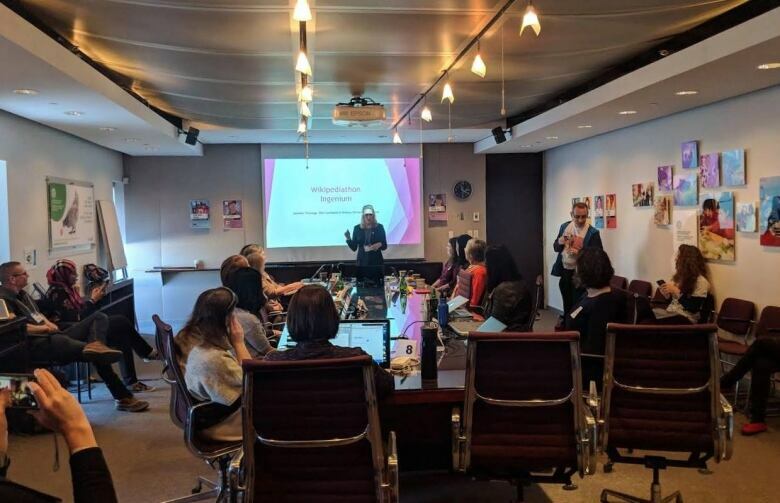 The online survey of 1,511 Canadians was commissioned by the non-profit group Girls Who Code and conducted by the market research firm Maru/Blue from March 1-3 and released for International Women’s Day today. The organization noted that a 2017 report by the business consulting firm McKinsey found women made up 47 per cent of the Canadian workforce, but only 23 per cent of the STEM workforce. Saujani said that’s a problem in a society that’s being transformed by automation through technology. “We need to make sure that half our labour force is included in that innovation and in that growth,” she said. She added that including women makes a difference to the development of products affecting everyone. She gave the example of Google auto-correcting “she” to “he” in a note between her and a colleague, assuming the editor they were talking about was male — something she suggests might not happen with a more diverse technology workforce. “That’s a small thing, but a really big thing,” she said. Saujani acknowledges that the poll didn’t ask how many male scientists or engineers they could name, but thinks the answer would “probably” be different. “Bill Gates is computer scientist, Mark Zuckerberg is a computer scientist,” she said. That’s one reason Ingenium organized an event where volunteers from the public collaborated to add more women scientists to the online encyclopedia Wikipedia for the International Day of Women and Girls in Science this past February. Corbeil acknowledged that in science, the individual contributions of scientists, whether they are men or women, tend to not be well known by the public. Ingenium faced its own controversy about the recognition of women scientists in 2015, when two female members of a selection committee for its Canadian Science and Engineering Hall of Fame quit over the fact that no women had been nominated for induction two years in a row. The program has since been discontinued. One of the two who resigned was Judy Illes, a University of British Columbia scientist who holds a Canada Research Chair in Neuroethics. She said the nominations weren’t reflecting women’s increasing contributions to science and engineering. “It wasn’t keeping apace and we weren’t doing enough to make that happen. It’s frustrating,” recalled Illes, who continues to push for gender equity in science. For International Women’s Day, Illes is co-organizing an event with consulates in five other countries to develop policies that can be applied internationally to address challenges that women in health, science and innovation still face. For example, she said, those could include ways to destigmatize time away from work to have children and better social programs to support couples where both members work. “A number of studies that show that when women are well integrated into board meetings, academia, engineering, that diversity of perspective, creativity, talent, inherent skill really brings greater richness to both the development and products of that workplace,” Illes added. She does think the recognition of women scientists has improved in recent years, with more of them winning awards such as research chairs and Orders of Canada.